What causes us to be shy in speaking? 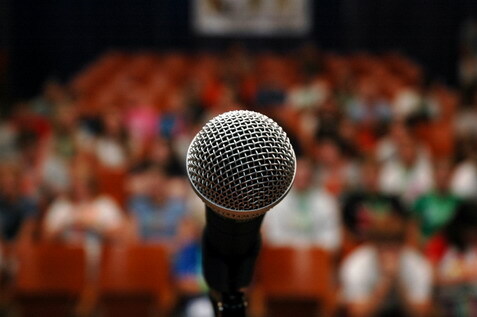 What causes us to be nervous before we give a talk? Someone I respect a great deal once told me that ‘shyness is pride.’ What he meant was that shy people spend too much time worrying about themselves and how they look in the eyes of other people, when they should be focusing on what’s outside, trying to do a good job, trying to add value to the situation. This is brilliant advice – start thinking about others and less about yourself. In fact, everyone else is actually thinking about themselves, too. Nobody really cares about you. So stop being so self absorbed. The idea is that we all have pride. The more we put ourselves outside our comfort zone, make mistakes in front of others, learn to take constructive feedback - the less ego we have. This resonates with a great deal that we have seen. Many times at the Mandir we will give constructive feedback to all age groups. We find the younger the age group the more apt they are to really receive this feedback and improve on it. When we talk with shishu aged kids, it is quite easy to work with them to be better presenters. Although they are getting feedback (or rules) all the time, it is amazing to see how readily they can internalize this feedback as long as it is explained to them so that they can digest it. The older we get and the older the speaker we talk to, feedback needs to become subtle as egos tend to get bruised more readily. Yogi Bapa showed a way around this by becoming a friend first (het karva shikvu), so giving this feedback takes time - maybe many years.